Experts have repeatedly warned there could be severe consequences for any business that is not ready to adopt and comply with the new lease accounting standards by the FASB/IASB deadlines. Yet in a 2018 survey of more than 2,000 finance leaders by Robert Half and Protiviti, over 55% of respondents said they had not yet begun the transition to FASB/IASB compliance. This should provide cause for concern. However, by taking the right steps now the road to compliance does not have to be a doomsday scenario. 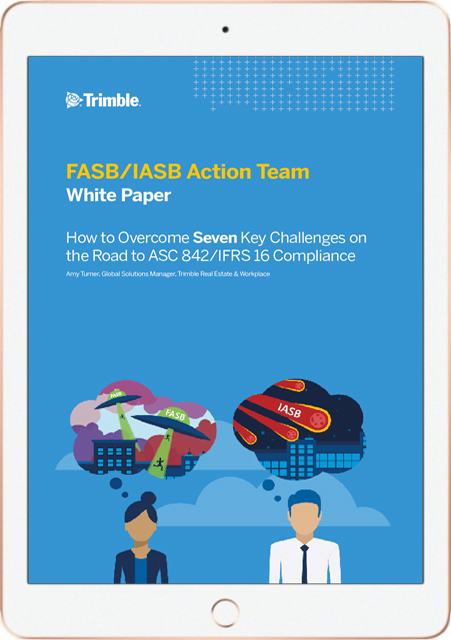 Our latest White Paper has been written by our team of FASB/IASB technology solution experts to help you understand seven of the biggest challenges your company may encounter on your journey to full compliance. In this paper, we review the challenges … provide recommendations … highlight best practices … and provide helpful guidance for developing your own roadmap to FASB/IASB compliance. This is the fourth in a series of white papers that examine the likely impact of the new lease accounting standards.